STARRETT have a broad range of power tool accessories available to tailor your equipment and help make those challenging jobs a little easier. As well as their ever popular range of yellow hole saws, which come in a full variety of sizes designed to cut all types of materials, perfect for joinery, metalwork, and carpentry amongst other uses; Starrett also produces products including jigsaw blades, reciprocating cutters and a range of items for more specialist operations. 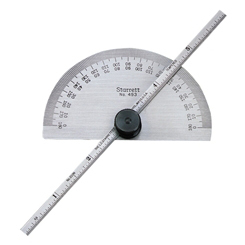 Starrett is also a leading manufacturer of precision measuring tools, ideal for those jobs when nothing but perfect accuracy will do. Whether you need a tape measure or a micrometer, or you are looking to measure something big or something tiny, Starrett will have the ideal tool for the job, saving you time and trouble. A full range of cleaning tools and oils are also available for Starrett tools, including for their high-accuracy depth and height gauges, as well as their other shop tools. If you are looking for quality tools to make those manual jobs easier, then Starrets iconic range of hand tools are second to none for quality and durability. Full tool kits are also available.